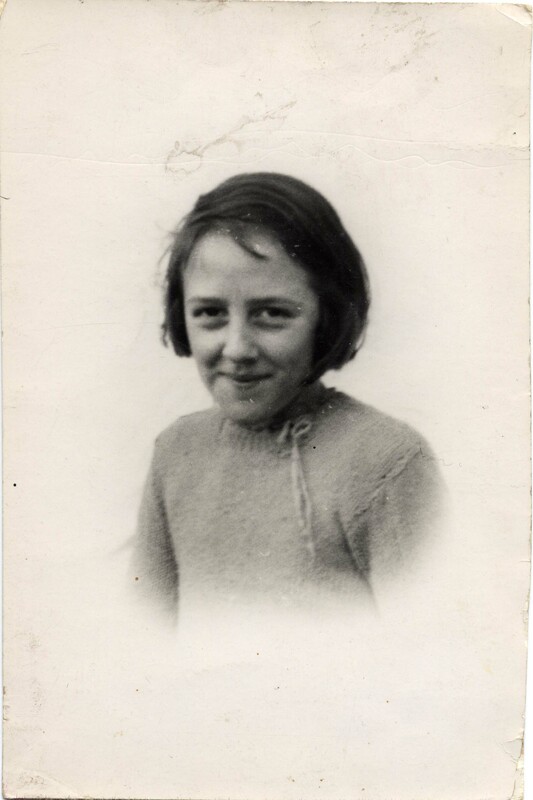 Betty Bryan (Topps), as a young girl, about 9 years old, living in Normanton. 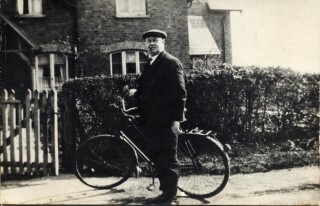 Bill Bryan outside the family home in Nomanton, around 1939. Contributed by Mrs Betty Topps. 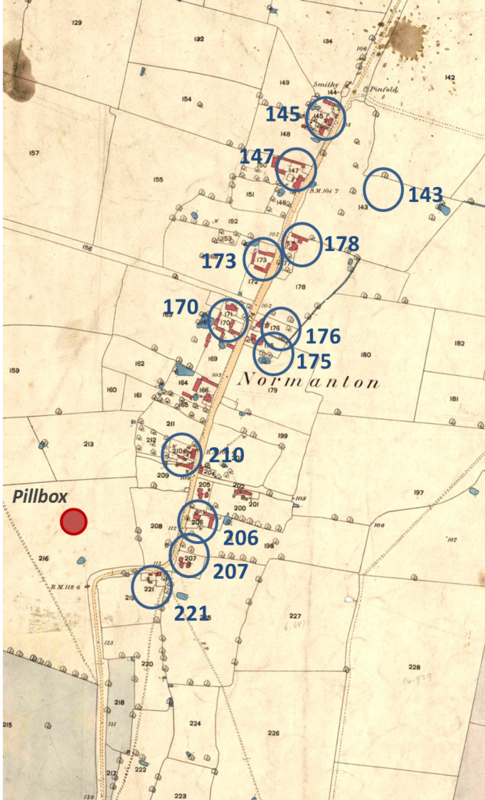 The location of houses as set out in Betty Topps' account, superimposed on the 1884 OS map of Normanton. 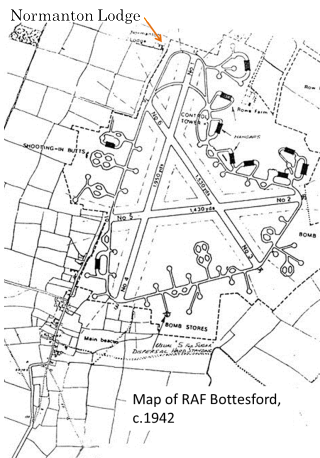 Little had changed in the layout of the village, until the advent of WW2 and the building of the RAF airfield. 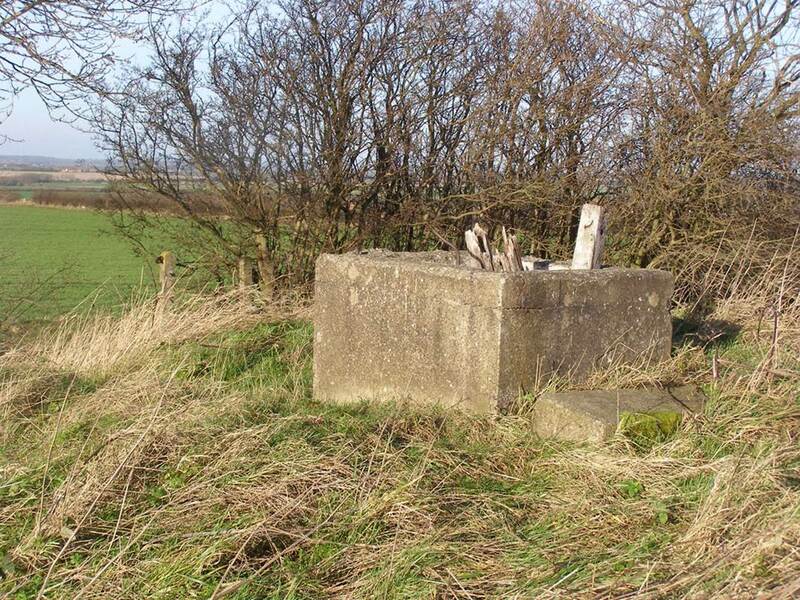 Also shown is the location of the WW2 pill box. 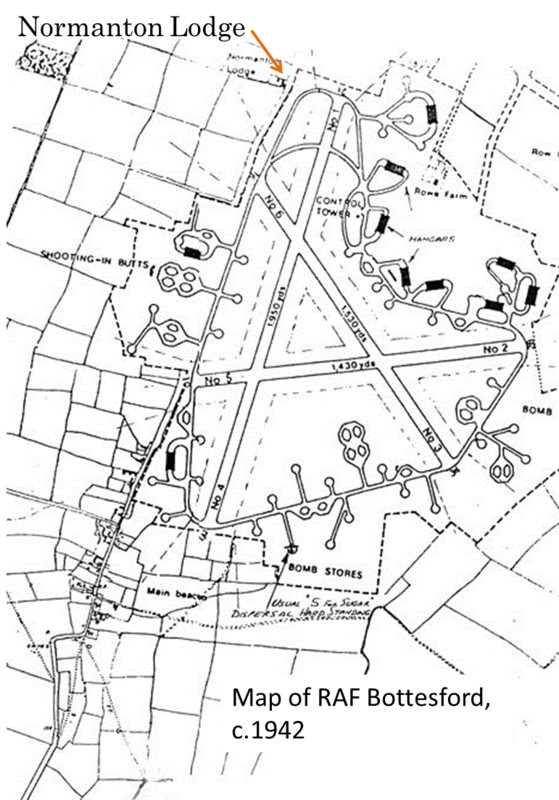 A map of the airfield as it was during WW2. 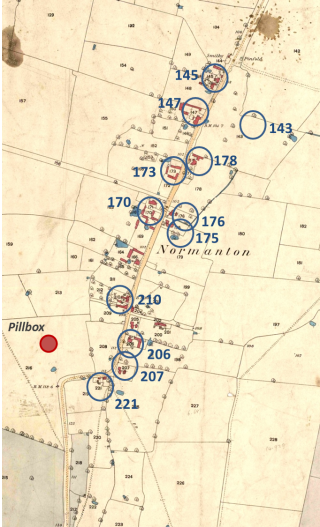 The location of Normaton Lodge is also indicated - where a plane hit the roof of the farmhouse one night while the occupants were in their beds (though none of the residents were seriously hurt). A WW2 defence position still in place in a field by the S-bend of Normanton Lane at the southern end of the village. 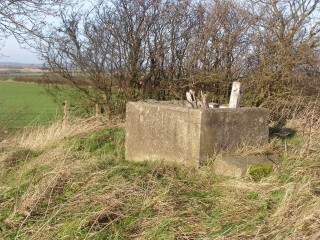 A picture of the remains of the Cold-War Observer Post that was built on top of Beacon Hill, Bottesford. There had previously been a WW2 observer post and possibly also an air-raid shelter on the hill, though their precise locations are uncertain and no traces remain. 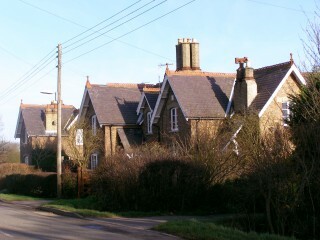 The estate cottages built on Normanton Lane in the late 19th Century. 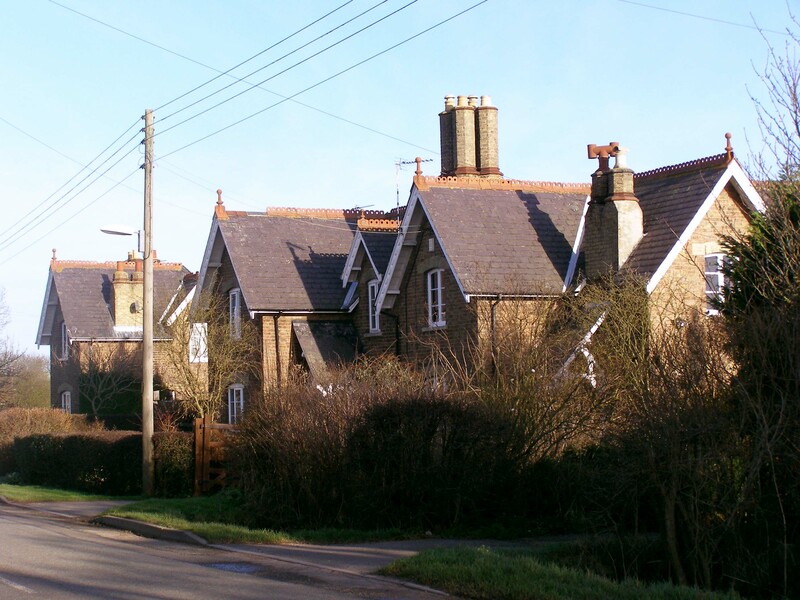 The Bryans porbably lived in the cottages furthest from this point of viewing. 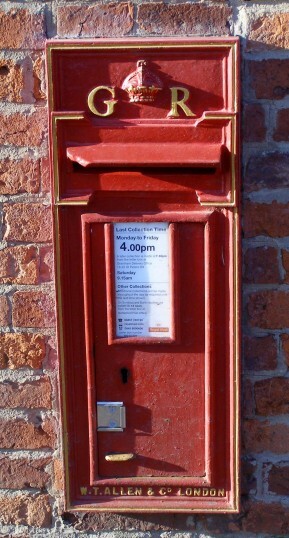 The old wall-mounted GPO post box in Normanton, dating from around the time of the Second World War (bearing the initials GR), photographed in 2007. 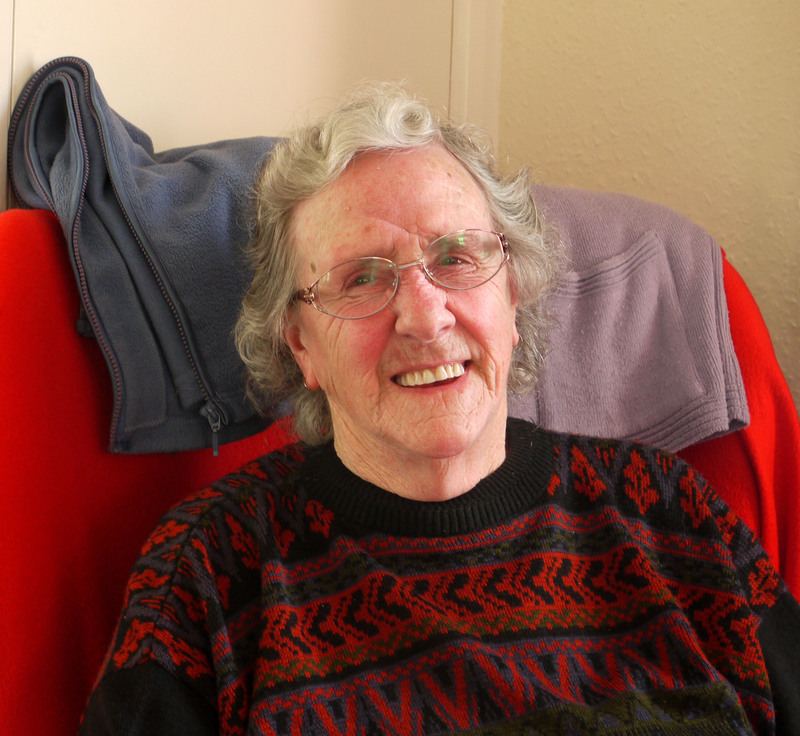 A portrait of Betty at her apartment in the Warwick Flats, Bottesford, taken in March 2015. I was born in 1930, the youngest child, with three older brothers and two sisters. I went to school in Bottesford with Ivan, Pat, Sid, and Dickie Robinson, Vera Skinner and the Flavell children. We girls wore Pixie hoods and the boys often teased us, so we walked separately to school. We used to have a warm at the gasworks, run by Mr. Markham, before going home. The gypsies used to camp in the spinney on the right hand side of the road going up to Normanton. It is not there now. 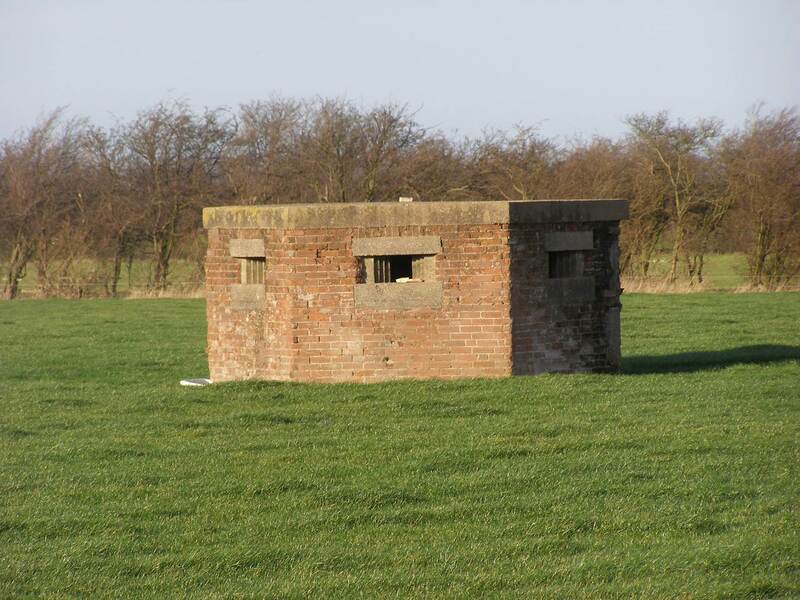 On the left hand side, near where the Pill Box is today, many sheds and huts were built and men were manning the anti-aircraft guns and the searchlights. I don’t remember much about school apart from being taught reading, writing and arithmetic. We practiced in the schoolyard what to do when the siren went off (we were supposed to go to different parts of the village), but it never happened. We had to carry our gas masks. Before the war we would picnic in the fields and go fishing in the ponds. It was said that the pond on the aerodrome was bottomless, but we did catch eels in it! We had a whip and top of course, but even better was an old bicycle wheel and a stick, where you could run along the road for ages. On Sundays we would walk to Bottesford for Sunday school at the Methodist church on the Green and then walk back home for dinner. We would play and dawdle in the vain hope that we would be too late for afternoon school, but it never happened. The Lovetts lived at Little Covert farm, and the Ravells also farmed in Normanton. Mrs. Staniford sold cigarettes, sweets and pop from her house. The boys would be allowed to step down into the cellar to bring up the pop. Mrs. Staniford would walk to the gate of the Hangar and hand sweets and crisps to the airmen going to their planes. We would count the planes going out and listen to them returning in the night. Normanton airfield was very much a part of our lives. You only had to walk to the end of our garden to see the planes. The corner of Mr. Barnes house was chipped off by a plane, but no one was hurt. On Fridays nights, mum and I would do the weekly shop in Bottesford. It was lovely to see the searchlights near the Pill Box, looking out for German planes, lighting up the road to Normanton. I think that there was a shelter on Palmers Hill, near the site of the Beacon today. I wonder if it is still there? At home, a steel shelter, supposed to sleep 3-4 people, was installed in our living room. It was not big enough for the whole family, so another was put in the yard, but never used, and it just rusted. The shelter could not be moved. Mum and I preferred the “Glory Hole”, a cupboard under the stairs, where we put two chairs. Were we frightened? We children were always told that the Jerries would never bomb Normanton because of the tall chimneys. There were times that we were frightened. I can remember the siren going off; my brother suddenly dashed next door and ushered an elderly lady into our house. He had just shut the door when a bomb dropped on Orston exploded, and the door was ripped out of his hands. I can recall lying in bed at night and seeing a plane on fire pass by my window. It veered down the nearby lane and crashed. I was not told the outcome. 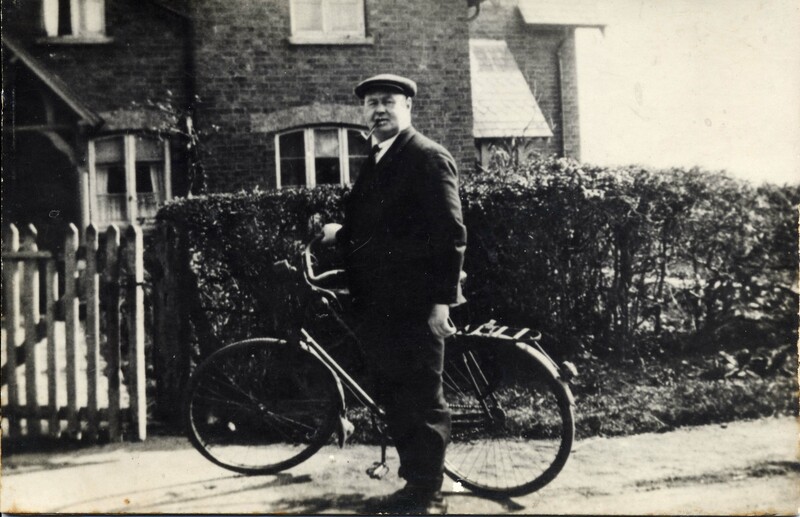 Betty’s father William (Bill) Bryan came from Coddington, near Newark, and worked as an agricultural engine driver, working steam traction engines. These included the systems where paired engines would haul ploughs and harrows to and fro across whole fields, creating a rapid means of preparing large acreages of land for planting. Use this link to read William Bryan’s WW1 war records. Her mother, Mabel, was a daughter of James and Elizabeth Exton, who came from Sedgebrook, Lincolnshire. Her parents moved to the cottage in Normanton probably after Bill left the army in 1919. Today, Betty lives in one of the sheltered apartments in the Warwick Flats in Bottesford, where she talked about her life in Normanton and generously permitted us to make scans of her family heirloom pictures. Use this link to look at Betty Topps’ pictures in the archive. Many memories of my aunt, making dripping sandwiches for the Lancaster crews. She was known as Mrs one hanger!